On Friday, July 31, most of the world will have a Blue Moon. On Friday, much of the world will have the opportunity to observe a Blue Moon: A somewhat rare occurrence that doesn't have anything to do with the moon's color. During most years, the Earth experiences 12 full moons, one in each month. But some years, such as 2015, have 13 full moons, and one of those "extra" lunar displays gets the label of Blue Moon. To see what I mean, here is a list of full-moon dates in 2015: Jan. 5, Feb. 3, March 5, April 4, May 4, June 2, July 2, July 31, Aug. 29, Sept. 28, Oct. 27, Nov. 25 and Dec. 25. 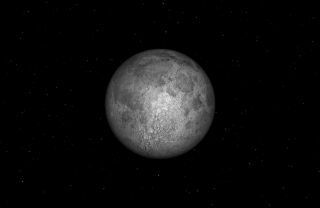 In 2016, the first full moon falls on Jan. 23, and each calendar month has only one full moon. The expression "once in a blue moon" has a long history of being used to describe rare events; but it was also used in the Maine Farmers' Almanac to describe the third full moon in a season that has four (normally, a three-month season will only have three full moons). In 1946, Sky & Telescope magazine published an article that misinterpreted the older definition, defining a Blue Moon as the second full moon in a calendar month. This has become the most recent and perhaps most widely accepted definition of a Blue Moon. And hence, the full moon on July 31 is referred to as a Blue Moon, because it was preceded by the full moon on July 2. By this definition, a Blue Moon occurs roughly once every 2.7 years. The full moon appears to last for at least the length of one night, but technically speaking, it is an instantaneous event: It occurs when the sun, Earth and moon fall close to a straight line. It takes place at the same instant everywhere in the world, whether the moon is above or below the horizon. The full moon on July 31 occurs at exactly 6:43 a.m. EDT (1043 GMT). So, when you look at the Blue Moon on Friday morning, don't expect to see a different color scheme (although it is possible for the moon to appear to have a bluish hue). Just be aware that the so-called Blue Moon is a byproduct of the contrast between the calendar month and the lunar month. Editor's note: If you capture an amazing view of the Blue Moon full moon of July 31 and would like to share it with Space.com for a story or gallery, send images and comments in to managing editor Tariq Malik at spacephotos@space.com.